This page outlines a number of examples of local and national housing projects that demonstrate one or several sustainability considerations. You can obtain fuller details of these examples by downloading the attached file of written information, and the picture files associated with the case studies. Lower Coxbridge, Near Glastonbury. Architect: Mark Orme; Contractor: Chris Anderson. Camelot Self Build Housing Co-operative; Architect: Innis Wilkins via Knightstone Housing Association; Project Manager: Chris Anderson; Assisted by: The Walter Segal Self-Build Trust. All the following projects prove very clearly that 'it can be done'. The Findhorn community in north-east Scotland promotes the integration of environmental and community awareness into people's lifestyle and spiritual philosophy. Since the 1980's the Findhorn Foundation has been gradually building a demonstration eco-village. 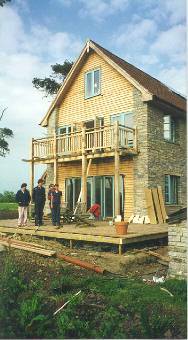 These are timber frame houses designed to be relatively simple to construct and therefore amenable to a low skill self-build process. The Walter Segal Trust generally fosters an environmentally and socially aware approach to building, and the Trust has won a number of awards for environmentally aware design, primarily for its community buildings. Brian Stichcombe's Straw Bale House, Brecon. This is one of the most important examples of a sustainable housing project as it integrates economic and community issues into the project as well as technical design issues. The Environment Trust's Green Homes are brick built, energy efficient houses, that are built and managed in order to secure long term affordability of housing .... (Download more info here). ZED: Zero Energy Development, Bio-Regional Development Group, Sutton, Surrey. Comely Green Place Sustainable Housing Project, Edinburgh. 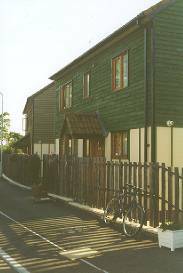 Two good examples of eco-house 'showhomes' that demonstrate a wide range of low energy, low water-use, natural material solutions, and clever design, are the Ecohome at the CREATE Centre in Smeaton Road, Bristol (Tel: ) and the EcoHouse run by Environ in Leicester (Tel: ). The Living Village Trust is a not-for-profit company limited by guarantee which is run by a paid board of directors. The inspiration of the trust was a belief in the need for sustainable development that creates local identity, community spirit, self sufficiency (in the broadest sense) and environmental awareness through good design and construction. A number of international examples are also relevant; most are included in a separate document. The Wise Group is a highly successful job creation, economic development and training project based on the refurbishment of social housing in run-down areas for increased energy efficiency, poverty reduction, environmental improvement, job creation and community regeneration ... (Download more info here). 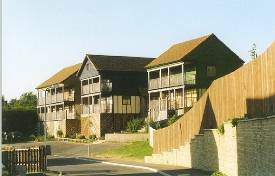 Mendip Council's affordable warmth programme for its housing stock was initiated in 1991, and is seen as one of several Best Practice examples in local government circles. The programme has had high levels of tenant involvement throughout and has raised NHER (National Home Energy Rating) values in Council housing stock from an average of 3 in 1991 to an average of 7 in 1999. In particular the strategy is noteworthy for charging lower rents for less efficient homes. Mendip are now working to extend the programme to private sector rented housing. Contact: David Lindsey-Bloom, Energy Efficiency Officer. There are now many, many examples of ecological and energy efficient house renovation or conversion projects. For example Gale & Snowden Architects in north Devon have been involved in both small and large house projects involving sensitive conversion or refurbishment. Many members of the EDA, the Permaculture Association and AECB have worked on their own home - over the years the magazines of all these organisations have included many informative articles on such projects. These organisations are good sources for advice and contacts for architects, builders and interior designers that understand the principles and practice of sustainable house refurbishment or conversion.